You know how it is when you need to knit just a little something? You search your patterns and your books, hoping to find the perfect combination — yarn from your stash, and instant gratification. You want a surprise, of sorts, but what you really want to do is knit something clever and satisfying. Presenting … Maine Morning Mitts from Clara Parkes’ brand new book, The Knitter’s Book of Yarn! I was lucky enough to receive an advance copy a couple of months ago, and I’ve read it at least twice. I’ve had to be content with the grainy photograph reproductions, and whatever else an uncorrected proof contains (typos and such), but I’ve been having a blast. I can’t begin to offer a review, or any sort of unbiased opinion. I am totally biased. Completely, unabashedly, and sincerely. I’m already a huge fan of Clara and many of the designers she recruited to work on this book, and a new fan of all the designers I wasn’t familiar with. And folks, Clara knows yarn. That’s what this is all about, after all. On Sunday morning, when I got that itch to knit a little something, I pulled out the yarn I’d spun a few weeks ago and cast on a new pair. Before long I was done, so I decided to start a matching scarf. This pattern is quite clever, and very satisfying. I adore both pairs, and they’ll be getting a lot of use this winter. I plan on working my way through the rest of the book, which is filled with clever and satisfying patterns. I can’t wait to get my hands on a finished copy! Every time I turn around these days, there’s something else going on, something I need to do, or something I’m looking forward to doing. I spent last week returning to reality at work, and getting a little cold to spite myself. Mitt-knitting on Sunday was quite therapeutic, and now that this week has reached the halfway point I’m feeling better. I’m somewhat reorganized at work, and I might even be able to make it to Knitting Circle tomorrow. On the horizon: Rhinebeck Weekend with Judy and the Fabulous R’s — it’s a tradition. A quick visit with my mom, if I can swing it. The Knitter’s Review Retreat. Before long, it will be Thanksgiving, and then Christmas! I’m not in a big hurry or anything, but is this year going by in a flash, or what? Edit/P.S. Clara kindly gave me permission to show my mitts! Both pairs are really nice! I’m looking forward to seeing the book – it seems like it will be very interesting. LOVE your mitts! Both versions! I wish I lived where it was cold enough to wear them for more than a month. I’m happy to hear the glowing review for Clara’s book — I’ve been anxiously awaiting for its release. There have been several occasions recently where I was wishing for a resource like that…. beautiful mitts – both of them! What a great way to show off your handspun.I can’t wait to see that book – it’s got to be wonderful, given that it’s Clara’s (a bit of bias here too – grin)Glad that things are settling in again for you – and yes,I agree, this year is flying by! Beautiful. It’s funny because I checked the link and that’s a book I would never think to buy on my own. 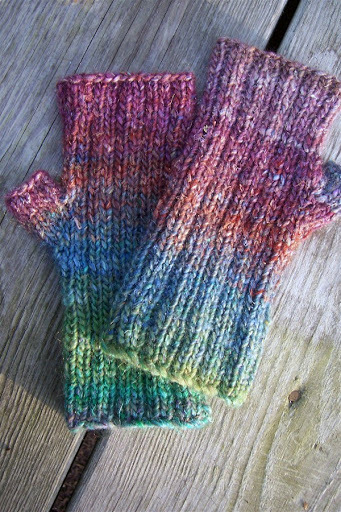 Do you love it?I know those aren’t the most complicated mitts ever but they are elegant in a simple way.Must have some. 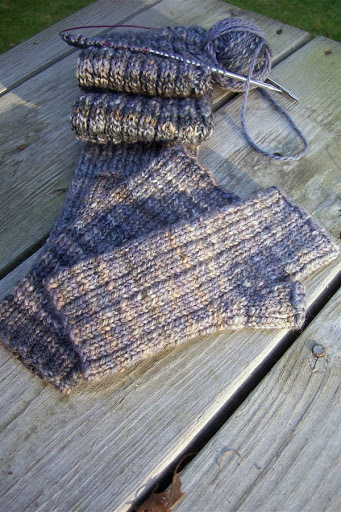 mmmmm….mitts! Simple but beautiful! Although last year with the mitts I made, I kept longing for fingers to them! I may need to knit both this year. Yes, the year seems to be flying by, I try to concentrate on one day, one week at a time, and focus on little accomplishments. Like will I make it to Knitting today? Those are some really cute mitts! Oh, what I’d give to be able to start on a fast start/finish project right now. The mitts will look great with your scarf! Now we just need some cooler weather…..
Jane, they are great! You think that you can’t wait to get your hands on the book? I’m dying to see the finished version – seeing the proofs (months ago, with the same grainy pictures and typos) was a real tease. See you at Rhinebeck. Oh Jane, they’re beautiful! And the Crown Mtn. Corriedale is a perfect pairing too. I can’t tell you what goosebumps it gives me to see what you’ve done, how you took this pattern and made it your own. I couldn’t possibly have hoped for more. Thank you Jane! Yummy mitts!! !I’m anxiously awaiting a skein of Sundara’as sock yarn to start my Hedgerows. What can I say? I’m a literalist at the moment! Thanks for reminding me about the book–I could have sworn I had it on order already, but I guess I didn’t. Situation remedied in the nick of time! Both pairs of mitts are beautiful! I’ve heard good things about that book. Mitt are such a quick and easy knit. I like knitting them. Love the mitts! Just what I could do with at the moment….the mornings are getting so cold and they look really toasty!!!!! I really love those Silk Garden mitts! The book sounds very intriguing, too. Ooh, I can’t wait for a copy of that book! Lovely mitts.